472 pages | 28 B/W Illus. Environmental Anthropology studies historic and present human-environment interactions. This volume illustrates the ways in which today's environmental anthropologists are constructing new paradigms for understanding the multiplicity of players, pressures, and ecologies in every environment, and the value of cultural knowledge of landscapes. 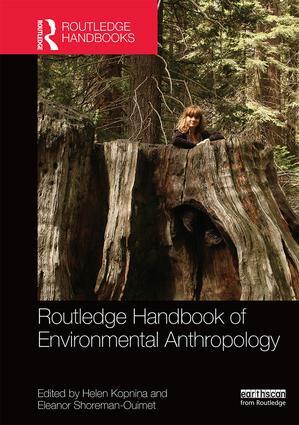 This Handbook provides a comprehensive survey of contemporary topics in environmental anthropology and thorough discussions on the current state and prospective future of the field in seven key sections. As the contributions to this Handbook demonstrate, the subfield of environmental anthropology is responding to cultural adaptations and responses to environmental changes in multiple and complex ways. As a discipline concerned primarily with human-environment interaction, environmental anthropologists recognize that we are now working within a pressure cooker of rapid environmental damage that is forcing behavioural and often cultural changes around the world. As we see in the breadth of topics presented in this volume, these environmental challenges have inspired renewed foci on traditional topics such as food procurement, ethnobiology, and spiritual ecology; and a broad new range of subjects, such as resilience, nonhuman rights, architectural anthropology, industrialism, and education. This volume enables scholars and students quick access to both established and trending environmental anthropological explorations into theory, methodology and practice. Helen Kopnina is assistant professor of environmental anthropology at the Institute of Cultural Anthropology and Development Sociology at Leiden University, the Netherlands. She is also a coordinator and lecturer within the Sustainable Business Program and researcher in the fields of environmental education and environmental social sciences at The Hague University of Applied Sciences, the Netherlands. Eleanor Shoreman-Ouimet is an environmental anthropologist and currently teaches in the Anthropology Department at the University of Connecticut, USA. Her research focuses on human–environment interactions, cross-cultural conservation practices, community response to natural hazards, and the effects of climate change.